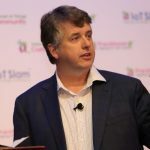 A welcome introduction from the IoT Slam Conference Chair and Internet of Things Community Advisory Board Chairman – Bill Mortimer. During the intro, Bill will highlight key details and updates on directions and community efforts. Bill will also share an overview of the event framework and highlights, before handing over to the headline opening keynote speaker.